Most of these methods will also work with FME 2013, but please see the section on older versions in the introduction for more information. While the FMEServerNotifier is very useful while a workspace is running, users often need to have something happen when a workspace completes - run another workspace, upload a file to S3, send an email, etc. This is where the web services come into play. When you are publishing a workspace, the final step is selecting on which of the FME Server web services to register the workspace. In the registration properties, you can specify a topic to notify on successful completion of the workspace, or on workspace failure. Data Download, Data Streaming, Job Submitter and Notification services all have this option. Please note that you have to specify notification topics for each of the services you will be using to run the workspace. So, for example, if you are running the workspace via the web interface, but also in response to incoming emails, you will need to configure the Job Submitter Service and the Notification Service. In this example, we will build on the previous workspace, and instead notify FME Server if the job completes successfully. Remove the FMEServerNotifier, and replace it with a Text File writer. You can use any output file you like for this. Once you've published the workspace as explained below, the output will be routed to the notification service instead. Connect JSONTemplater to the Text File writer, then connect the '_result' attribute to 'text_line_data' attribute on the writer. Configure an email subscriber which is subscribed to SAMPLE_SUCCESS_TOPIC. 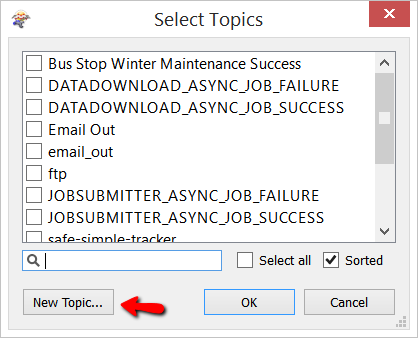 Run it through the FME Server Job Submitter service, and when the job completes successfully, a notification will be sent to SAMPLE_SUCCESS_TOPIC. If you provide an invalid dataset, the workspace will fail, and the default failure notification will be sent to SAMPLE_FAIL_TOPIC. Since the text file is never written, the information contained therein won’t be available. Duplicate the success email subscription from step 4 above. Subscribe it to the SAMPLE_FAIL_TOPIC. There is also the option of notifying on success or failure of a scheduled job. Simply publish the workspace to Job Submitter without special configuration, and then fill out a success and failure topic in the configuration screen for the schedule. Publish the workspace without success and failure topics set. Schedule the job, and select success and failure topics. 3. Wait for the scheduled job to run, and you will see the notification coming up in the Monitoring tab, or in your email client.